MegaBackup is a highly secure storage network comprised of telco-grade storage arrays housed in secure “lights out” data vaults on the east and west coasts of the United States. Data is simultaneously mirrored at each location. We’ve also gone the extra mile to ensure our services are compliant with many of the industry’s leading regulations including HIPAA, FINRA and PCI. The service runs automatically on your individual desktops as well as your Windows servers to ensure the most recent copy of your data is backed up. As long as our software detects an Internet connection, it will automatically back up at the times you specify. If for any reason MegaBackup can’t run a scheduled session, be it a power or Internet loss, MegaBackup will automatically run as soon as a connection is next detected. Great for a home office or laptop computer! Back up all of your office’s critical data! Great for companies that need to back up servers as well as desktops! Perfect for large offices and multi-site companies! Setting up the service is fast and simple – users only need to download our software, set up their account credentials, and choose the folders they wish to back up. That’s it. Done. All data backed up by MegaBackup is done so securely – all data is encrypted before it even leaves your computer, using the same level of encryption used by the US Military. Your files are stored, in encrypted form, on multiple servers in high security facilities. Not even Meganet personnel can access your data. 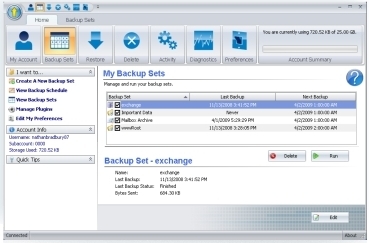 MegaBackup is the perfect backup solution for any sized business, in any industry. Because it’s Internet-based, it can be used to supplement a local hard drive or tape backup system, without incurring additional hardware costs. Companies with employees that use laptops in the field or on the road can help ensure that a lost PC or hard drive crash doesn’t impact business; it’s estimated that the monetary loss of just a single business hard drive is over $60,000. Protect yourself, your data, and your company with MegaBackup. Business accounts begin at just $29.99 per month. Free trials are available upon request. Contact a sales representative today!